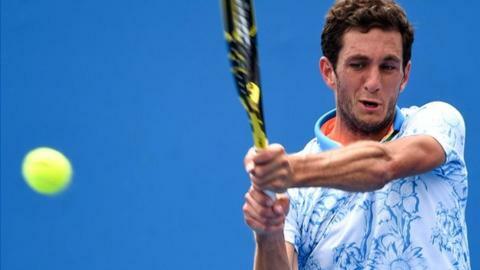 British number two James Ward came through the final round of qualifying to join Andy Murray in the main draw at the Dubai Championships. Ward, ranked 106th, beat Romania's Marius Copil 6-7 (3-7) 6-4 6-4 to reach the first-round proper, where he will play Spain's Feliciano Lopez. Murray begins his campaign against Luxembourg's Gilles Muller, who is coached by Briton Jamie Delgado. Heather Watson lost 6-3 6-3 to China's Saisai Zheng in Doha qualifying. Novak Djokovic and Roger Federer are the top seeds in Dubai, with Murray seeded third. That is likely to be in line with his world ranking on Monday when the Scot is set to overtake Rafael Nadal in the standings, following the Spaniard's semi-final loss in Rio on Saturday. Murray was beaten by Frenchman Gilles Simon in the quarter-finals in Rotterdam last week, the Scot's first tournament since losing to Djokovic in the Australian Open final three weeks ago. "I feel good," said Murray. "I arrived a couple of days ago and have been practising indoors these last few days and getting my body clock ready. "It has been a good start to the year so far." Djokovic will return to action for the first time since claiming his eighth Grand Slam title in Melbourne, when he recovered from a mid-match slump to beat Murray in four sets. "I don't think 20 or 30 minutes [feeling weak] is a major concern for the future," said the Serb, a four-time champion in Dubai. "On the contrary, I think that being able to bounce back from that period of 20 minutes and finish the match the way I finished it can only serve as an encouraging fact." Djokovic will take on Canada's Vasek Pospisil in the first round in Dubai, while Federer plays Russian Mikhail Youzhny. In Marseille, the British pairing of Colin Murray and Jonny Marray showed good form ahead of the British Davis Cup team announcement as they reached the doubles final, eventually losing 6-4 3-6 10-8 to Marin Draganja and Henri Kontinen.